Except from their Ayurvedic properties the Ayurvana products are also free from artificial colouring, chemical preservatives, paraben and aluminium. Furthermore they're organic (certified by the Ecocert label) and not tested on animals. Have you ever heard about so much goodness in one brand? Well I haven't so my expectations to the products were quite high. I was sent a facial cream, a night cream, a face scrub, a body care gel and a joint soothing gel. I didn't try the last one as I luckily don't have much problems with joint pain yet. However I handed it down to my mum who was really impressed by the Ayurvana principles as well. "The tulsi is a sacred herb traditionally used in Ayurvedic medicine to detoxify the body." "The three berries composing the Triphala are traditionally used in Ayurvedic medicine for their toning and regenerating properties." 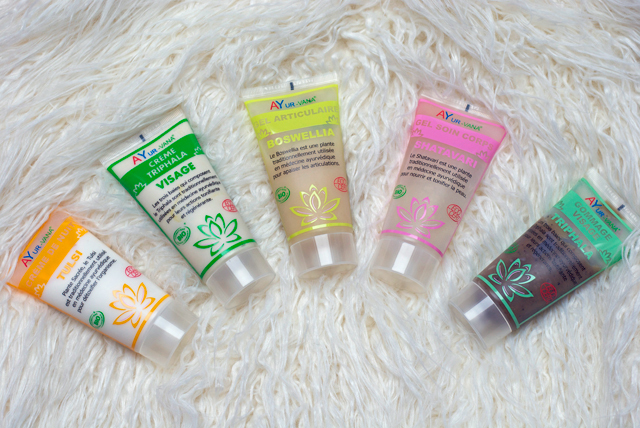 As you might know from several other reviews I'm super picky with face creams but there is really nothing bad to say against the Ayurvana ones. No unwanted transpiration when applying them and they absorb quickly. As they're free from perfume they both have a really natural skin, the facial cream smelling of lemon as it contains essential lemon oil and the night cream mostly smelling of the calendula water it contains. Both creams furthermore contain aloe vera, another ingredient which I love to see in creams. So all in all I'm really satisfied with the creams and I could notice the regenerating and antiseptic effect of the night cream right away. The face scrub also contains Triphala and thus complements the day cream. I really like the texture of it as it's quite slushy and the grains have the perfect size. The scrub contains cinnamon which gives the scrub its smell and stimulates the blood flow as I could notice when using it on my décolleté. My skin felt great after using the scrub and so far it's definitely one of the best I ever tried. "Shatavari is traditionally used in Ayurvedic medicine to nourish and to tone the skin." Also the body gel smells really fresh because of the essential tangerine and orange oils it contains. The appeasing and toning effects are noticeable immediately. Still it wouldn't be my first choice when it comes to nourishing really dry skin as it mainly contains floral waters. The products I have tried circa cost between 11€ and 24€ but as the tubes contain 75ml you will handle quite long with the face products. Still I think they're only worth spending the money if can value the fact that they're 100% natural because when it comes to the effect they might not be better than cheaper products. I am definitely glad that I got the chance to try them as I know that I can only do my skin good when using them. If you wanna give the one or the other product a try you can check them out on the Ayurvana web page. natural is always a good way to go...thank you for sharing these lovely beauty products with us! Oh this is interesting - I have not heard about this brand before! That does sound like a great deal! I would love to be able to sample different products or review clothes :) I'm glad you had a good experience with Ayurvana!